Ethereum hit the market at the end of 2013 and started gaining momentum in 2014 which is about 6 years after the arrival of Blockchain technology. Considering its time of emergence and its capacity, it is obvious that Ethereum has come a long way in the path of success by way of attracting a majority of entrepreneurs and crypto investors now. With this said, there is no wonder about a capitalist wanting to build an Ethereum Blockchain for commercial purposes. Hire Ethereum Blockchain Developer to implement Blockchain for a phenomenal upbeat. 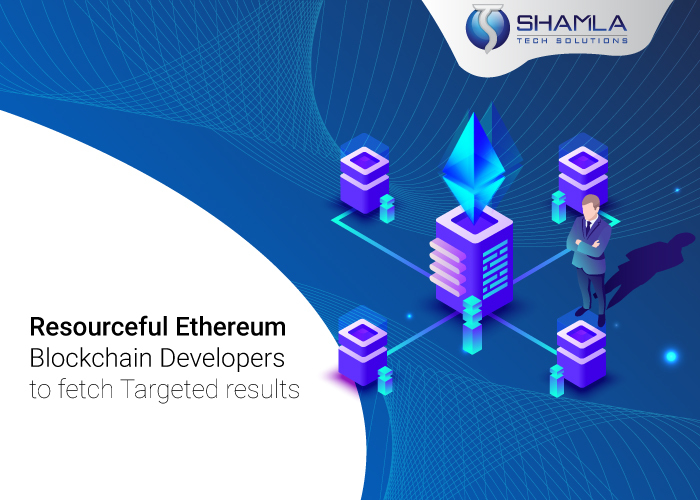 SHAMLA TECH, as an Ethereum Blockchain Development Company, comprises of Blockchain professionals who specialize in Ethereum Blockchain Development. We offer end to end Blockchain development services for enterprises belonging to various sectors such as healthcare, e-commerce, telecom, supply chain and logistics. Hire Ethereum Blockchain Developer with us for flawless Blockchain solutions. Ethereum is an open source software with a Blockchain base. It breaks down and simplifies the development of smart contracts and decentralized applications which are popularly known as DApps. Ethereum supports the creation of several decentralized applications in a short span of time. These applications run without interruption of any kind. They stay free of spam with crucial smart contract audits. Why is Ethereum Blockchain Development imperative? With Ethereum, it is easy to construct and deploy decentralized applications. A decentralized application serves a specific purpose based on its nature. Let us consider Bitcoin for instance. Bitcoin is a DApp that facilitates crypto (Bitcoin) payments at a faster rate on a peer to peer basis. Any DApp irrespective of its chief purpose comprises codes that run on a Blockchain network and does not depend on a central to perform its functions. Ethereum relies heavily upon Ethereum Virtual Machine (EVM) for its functionality. In other words, EVM is the primary software that keeps the Ethereum network active. The Ethereum Virtual Machine paves way for the transformation of Ethereum blockchain applications into simpler ones. Rather than building a fresh blockchain for each new application, Ethereum empowers the advancement of various applications all at once. Permanence – The immutable feature of Blockchain ensures that no intermediate is given the right to modify the data. Security- as Blockchain presents a safer space, the apps on the network enjoy the fullest security and keep away from fraudulence.No downtime- With the enormous capacity of the Ethereum Blockchain, there is zero downtime for the apps on the network. Quality is the benchmark of SHAMLA TECH; we guarantee reliable blockchain solutions tailored to cater to the needs of the clients. We extend world-class Blockchain solutions with expert Blockchain professionals who understand the vision of our clients and work accordingly. Hire Ethereum BlockChain Developer and Programmer with us for highly personalized Blockchain endeavors.